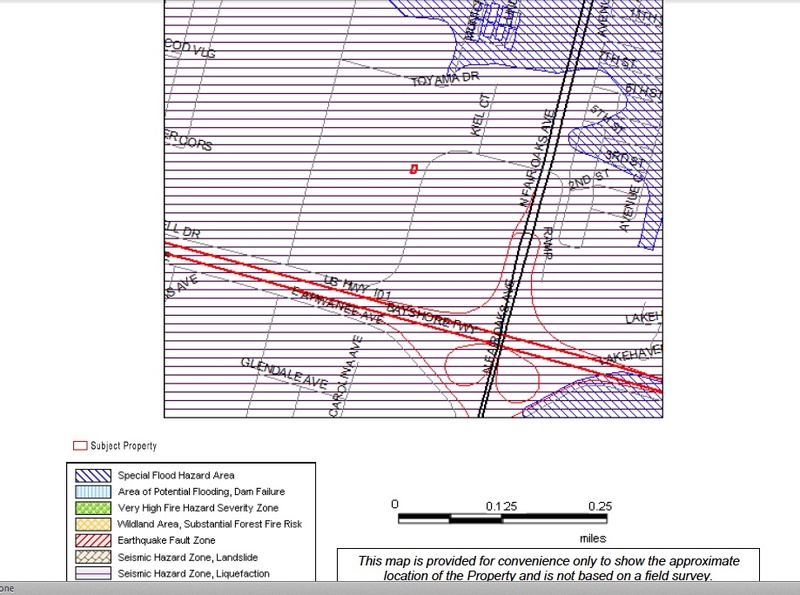 This illustration is a screen capture from a JCP Natural Hazards Report mapping Seismic Hazard liquefaction and FEMA Special Flood Hazard area at the Fair Oaks/101/East Weddell/Tasman location. California Public Resources Code Section 2696 requires the delineation and mapping of “Seismic Hazard Zones” in California. Affected cities and counties must regulate certain development projects within these zones. Construction or development including additions,on affected properties may be subject to the findings of a geological report prepared by a registered California geologist. Seismic Hazard Zones are regulatory zones that encompass areas prone to liquefaction (failure of water saturated soil) and earthquake induced landslides.